The Parr’s return for another super powered family adventure in Brad Bird’s long awaited Incredibles 2. The Incredibles came out before the current superhero renaissance that currently fills screens. There were superhero films at the time but not to the same extent or standard that we have now so it stood out as something new, fun and interesting. 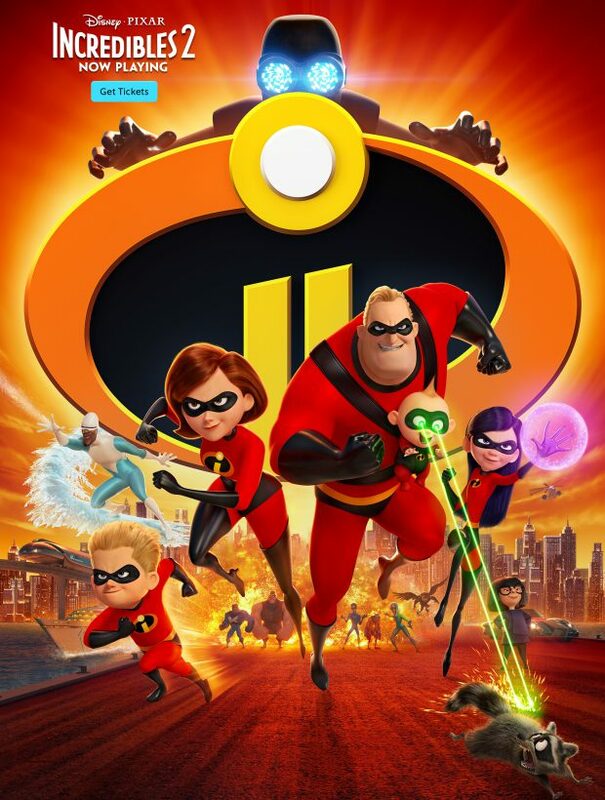 A 14 year gap between sequels has given us the highly successful Marvel Cinematic Universe, the less successful DC Extended Universe, the growth of the X-Men franchise at Fox and isolated pockets of other individual superhero properties so it’s a very different landscape that Incredibles 2 has to work to be relevant in. Brad Bird takes a really clever approach with this sequel by commenting on the current state of superhero movies in a way that feels really relevant. Holly Hunter’s Elastigirl takes the lead this time when a philanthropic superhero fanboy, Winston Deavor (Bob Odenkirk) takes it upon himself to prove that costumed heroes are something the world should embrace rather than demonise. Public relations is the key and Helen aka Elastigirl is specifically selected because she has more finesse than Bob aka Mr. Incredible (Craig T. Nelson) who specialises in brute strength that causes a lot of collateral damage. Incredibles 2 isn’t specifically about representation but it’s hard not to see the intent when considering the media attention given to the lack of female led superhero franchises in the current landscape. The good thing is that this film makes the point about representation by delivering one of the best examples of a woman taking the lead in a tent-pole movie. Helen is a great character who gains so much more depth than she enjoyed in the first one. She’s skilled, resourceful, intelligent but also vulnerable and fallible. Brad Bird deftly dodges the common mistake of confusing strong with well written by writing Helen fas a fully realised person who doesn’t have the answers all of the time, gets a little too caught up in her new role at the expense of her family and reacts to situations in a realistic way as dictated by her established traits. The story she is involved in is a little predictable at times but it’s well told and builds naturally throughout. Bob takes on the role of the stay at home parent tasked with looking after the kids and this is where most of the comedy comes from. There’s a defined arc for Bob who transitions from being jealous of his wife’s new success that causes him to feel marginalised to a fully supportive partner who understands the difficulties that come with looking after the children. It’s a good point well made and lends itself to some great comedic situations. Bob finds himself unable to cope with the demands of his super powered kids. He struggles with things like helping with homework, handling Violet’s (Sarah Vowell) difficulties dealing with a boy she has a crush on and keeping control of baby Jack-Jack’s constantly expanding list of super powers. There are some real laugh out loud moments in these scenes and it delivers a wonderfully exaggerated account of the difficulties that genuinely come without being a parent. In true Pixar tradition the film uses a fantastical situation to tell a very relatable story and applies some real emotional weight to it that makes it constantly compelling to watch. The family dynamic of the first film is one of the things that has allowed its popularity to endure and this continues here. Violet and Dashiell (Huck Millner)may come and go as far as the story goes but they’re really important to the world this show inhabits because their presence helps make Bob and Helen into characters with depth who are pulled in different directions by their conflicting responsibilities. The dysfunction may be played by laughs and is exaggerated by the presence of super powers but any member of a family will be able to watch this and recognise the problems. The great thing about the powers is that they feed directly into the characters and reveal a lot about them just as they did in the first film. Violet is largely defined by frustrated embarrassment with her invisibility serving as a way for her to escape and Dashiell is hyperactive to the point of restlessness with his speed representing his desire for input as he rushes around trying to fill his time any way he can. Bob’s strength and lack of finesse reflect his impatience and irritation at his inability to be an effective stay at home dad. Helen’s elastic powers are a clear sign of her flexibility and adaptability. A superhero film wouldn’t be the same without set pieces and this film contains more than its fair share of memorable ones. Each of them are distinct, creative and exciting in their own right. The situations lend themselves to inventive use of the various powers on display with a good mix of solo action and teamwork depending on the requirements of the situation. Stakes are built naturally and the resolutions feel logical. The sense of humour is also never forgotten and feels appropriate. Basically the action is really well put together because as with everything it is informed by the characters who are at the heart of everything this film does. An excellent sequel and a highly impressive entry into the prolific superhero genre. Using Helen aka Elastigirl as the lead while Bob aka Mr. Incredible takes on the task of looking after the kids is a nice touch as it addresses the idea of representation in superhero movies without being overt about it while making great use of Helen’s status as a fully realised interesting character more than capable of carrying the film. The Helen plot is at times predictable but the story is well told and constantly interesting. Bob’s part of the plot is where much of the comedy comes from but it also delivers great examples of the difficulties that come with raising a family. Bob realising what Helen had to deal with and appreciating that his job wasn’t any more difficult than hers is the basis of his character arc and plays out brilliantly. As before the super powers are a metaphor for the individual and collective struggles the family face which works really well. The film also boasts creative, memorable and exciting set pieces that uses the various powers in inventive ways. The resolutions feel logical and the characters form the heart of everything this film does.